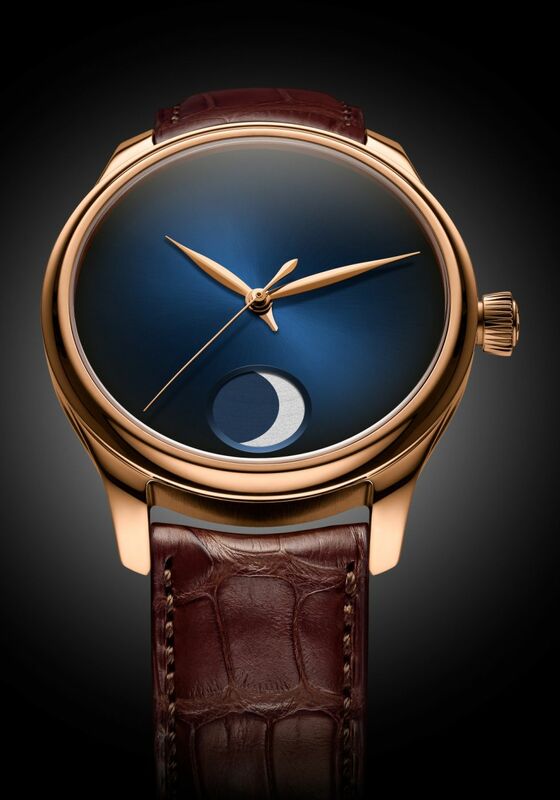 A perpetual moon, the Endeavour Perpetual Moon Concept is one of the most precise moon phases available, with one day's deviation every 1,027 years. The case, in stainless steel or in 18kt red gold, measures 42mm x 12.9mm. It has a sapphire crystal. 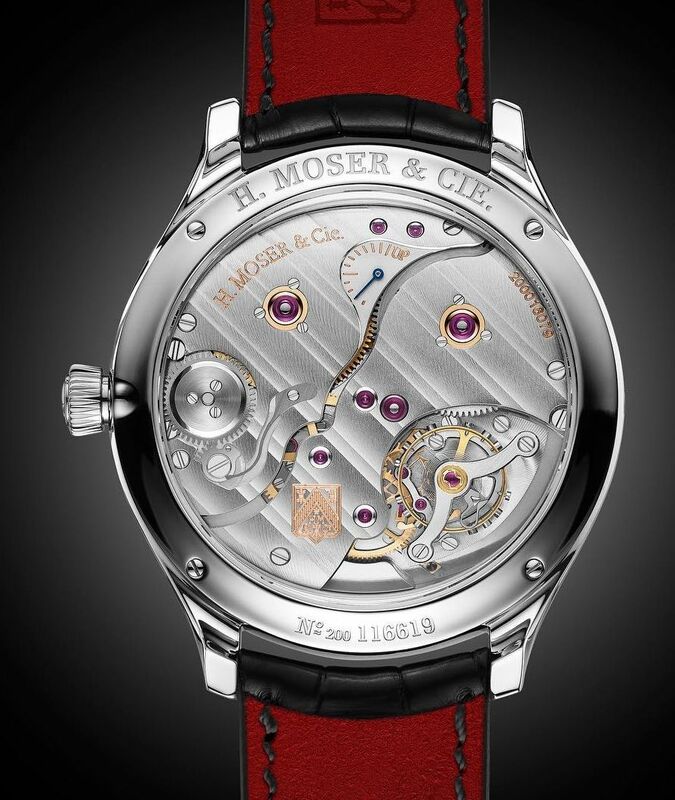 Movement is the Swiss manual-wind H. Moser in-house caliber HMC 801 Manufacture caliber with 28 jewels and screwed gold mounts, 18,000 vph and a power reserve of 7 days. It has a bevelled ring and Moser teeth for all wheels and pinions. Interchangeable Moser escapement with Original Straumann hairspring. Traditional screw balance wheel with gold adjusting screws Gold escapement wheel and pallet fork. Functions are: hours and minutes. Central seconds hand and hacking seconds. AM/PM indicator Hours 12 to 6 o'clock representing AM and 7 to 11 o'clock representing PM. Large moonphase indicator display. Power reserve indicator on movement side. 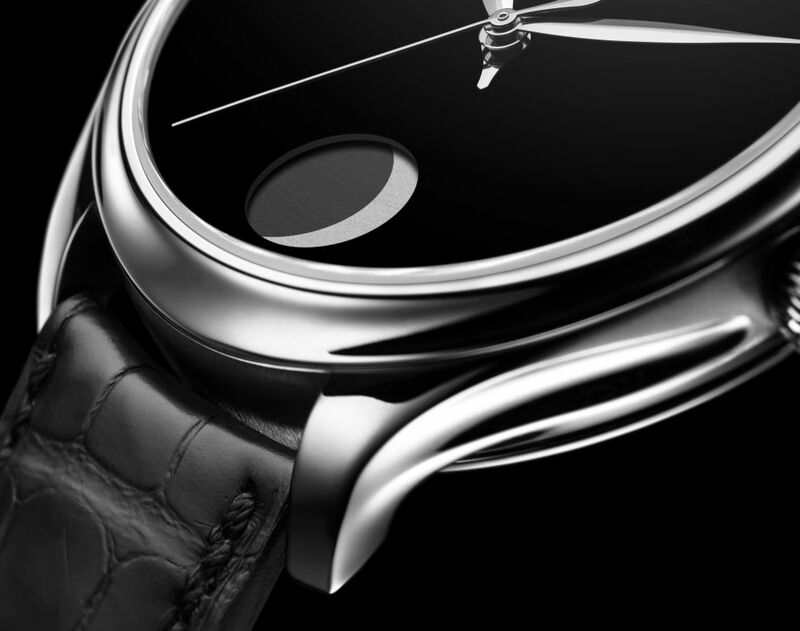 Moonphase adjuster push-button on the case flank. 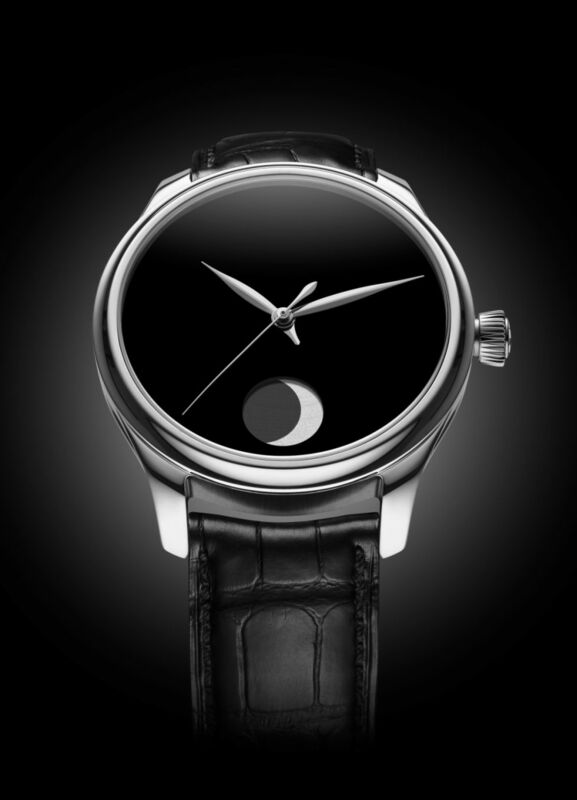 The moonphase system is an extremely precise display that can be set, read and predicted to within a minute. The system can be easily adjusted using a push-button on the side of the case. On average, the moon's orbital period lasts 29.53059 days. To be more precise: 29 days, 12 hours, 44 minutes and 2.9 seconds. The Endeavour Perpetual Moon Concept's intricate wheel train portrays this interval so precisely that the gap is a mere 0.23 seconds per day, that is to say one day's deviation after 1,027.3 years, making it the most precise model available. 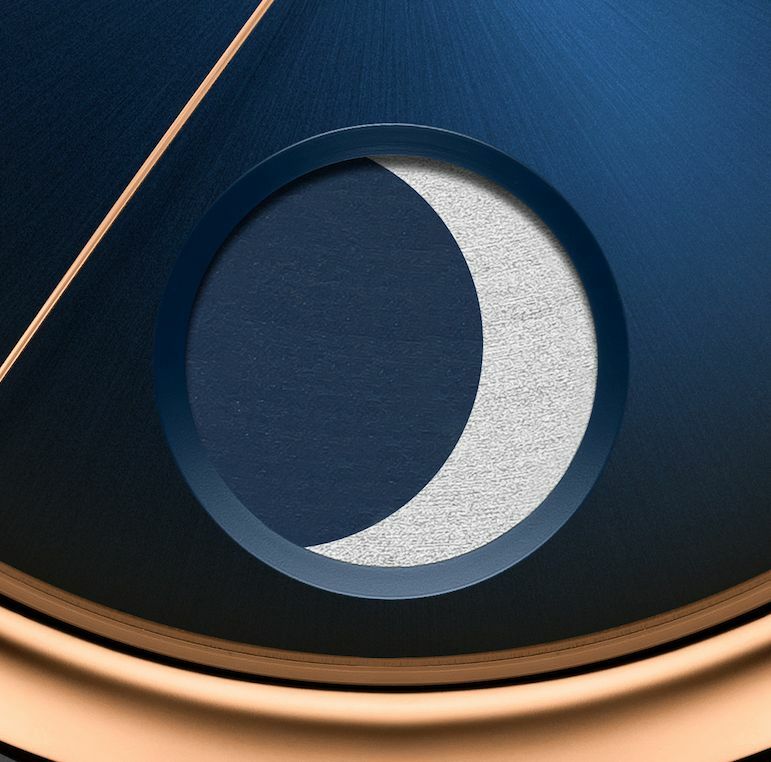 It has a Vantablack or a midnight-blue fumé dial with sunburst pattern. Leaf-shaped hour and minute hands. Central seconds and AM/PM hands. Moonphase window. Vantablack is an ultra-black coating, regarded as the darkest substance of all, and it is used in astrophysics in telescopes and by the army as thermal camouflage. It is composed of carbon nanotubes that are vertically aligned next to each other and is capable of absorbing 99.965% of light. It is the darkest black dial to be produced yet. It comes on a hand-stitched black or brown alligator leather strap with a steel or an 18kt red gold pin buckle with engraved logo.